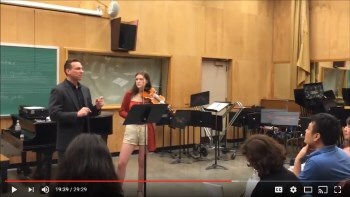 This is a live video of me conducting a Practiclass at the International Teacher’s Retreat at the Jacobs School of Music at Indiana University. A Practiclass is an innovative learning experience in the form of a masterclass. Students bring in things in their pieces that they have worked on for weeks or months, but just can’t seem to get no matter how much they practice. They seem to have tried as hard as they can, but are lacking some undefined element that others who could play it have (talent?). What it always turns out to be is the way they work, and we investigate, experiment, and find the unintuitive solutions that lead all to good performance. Each situation is unique, but addresses things in most everyone’s practice that need work. I teach these things to the audience while I work with the student. The links will take you directly to the starting point for that annotation, and the other timing is the recommended point to watch to. (:31-1:12) First attempt and it sounds pretty good. Many small problems that keep her from a confident performance are covered up, but it does not sound clean and, as she says at the end, she does not feel comfortable at that section when she plays it. It is hard to express yourself if you are fighting with your technique even if it sounds this good. She has worked hard already, and we might compare her to a ‘more talented’ student who in a shorter period of time could perfect and command that section at tempo. But guess what, it turns out it is only the WAY she is working. More on that in a minute. (2:39-3:13) Slow it down and notice how much bigger the small problems seem. Time to identify and correct. (3:14-4:53) Taking it apart and beginning to use varied repetition. The first one we use is right hand only to begin to address the string crossing problems we found when we slowed it down. Over the next 20 minutes or so we slowly incorporate other variations to find the sweet spot of learning. I also demonstrate the ‘international sign of learning’ Feel The Blearn! (7:48-8:50) After some initial attempts at varied repetition using the right and left hands we start to look beyond that for the ‘sweet spot’ and begin to find it. The focus in the student’s eyes and approach becomes more evident. Learning efficiency is increased. We keep pushing and as we begin to solve one thing we then introduce a more difficult variation getting closer and closer to the sweet spot. (9:16-10:10) Beginning to find that sweet spot. We’re starting to get there and we can see it in her eyes narrowing and the brow furrowing. Focus is increased and attention to detail heightened, a condition usually lacking in the practice of the ‘untalented’. We’re learning to Feel The Blearn (the burn of learning). I explain how these things direct our attention to overlooked places, and how our current use of assessment may not be evaluating the right things in the learning process. (22:57-28:24) After much instruction to both student and group we go for the payoff. Here she is ending her first attempt at a safe tempo. Cleaner, and much more in control (as she says). Then we start kicking up the metronome speed and what do you know? She can play it faster and cleaner than ever before, and is now and in complete control, so that she can now work on expressing that section as she feels rather than wrestling with technical issues. She told us she has been working on this for one or two months, yet we solved it in under 30 minutes. Actually it was much less. What took most of the time was my teaching the group the particulars of this situation so that they could use it in their teaching and practicing (Each situation in a Practiclass has a unique set of psychological and neurobiological issues to understand). In reality this would take about 10 minutes in practice over a few days. This is Phillip, and he is 13. He was an excellent violin student. He worked hard and made good progress. His teacher, Dr. Brenda Brenner at Indiana University, thought it was time to try his hand at competing. They would have been happy if he made the cut to compete, but were not sure he was ready even for that. It would still be a valuable experience to build on. That is when Brenda sent him to me. A little over 2 months before the competition I began an 8-week cycle of practice coaching with him. In between his private lessons we would meet by Skype for an hour and craft his practicing slowly building it into finely tuned high efficiency learning. 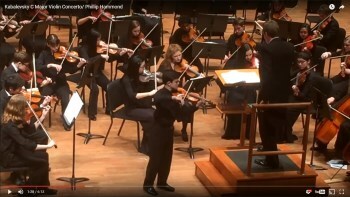 It was also inspiring for Phillip to be able to control his technique and express himself without worrying about losing control in certain sections while performing. It made him want to do even more. After all talent exists in that small space where you think you can’t do it, but you actually can. Once one experiences that more work is more fun. When the time came we were all thrilled that he made the cut and would compete. This was a big deal in his development. It was even better when he took first place, and it was Practice Coaching that gave him the edge. He now uses these techniques and continues to grow his practice ability on his own. Here is his performance with the orchestra. 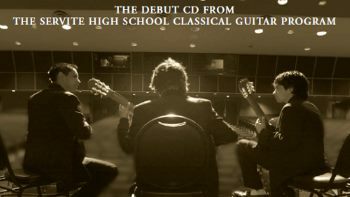 These recordings are of students in their second to third (and in a few cases) fourth year of study during my tenure designing and maintaining the classical guitar program at Servite High School 8/2000-6/2013 and do not represent any period thereafter. For current program information please contact the school. All of these students came to the classical guitar with no previous experience in a beginning guitar class offered as an elective to the entire student body. Those that would follow directions would improve, and many elected to go on to the second year and beyond where the focus is small ensemble. These videos document the ongoing process at different levels, and sound pretty cool as well. These are small ensemble performances of my students that we recorded and released as the CD We Wish You A Merry Christmas – Sounds of the Season and Classical Gems in 2004. This was my fourth year founding and designing the classical guitar program that would go on to do some good things. 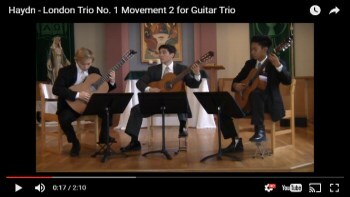 This was the first time we worked so deeply on any repertoire – kind of like Christmas carol etudes for guitar ensemble. They sound young, but very musical and this is perfect for Christmas morning, parties, or just blasting through headphones! All Christmas Carols arranged for guitar quartet by Caluda, Mallard, Mays, taken from the collection Christmas for Guitars published by Clear Note Publications (find them here), except O’ Holy Night and Have Yourself a Merry Little Christmas arranged for guitar duo by Tom Poore (available for free! ), and Carol of the Bells transcribed for guitar trio by Guy Cantwell published by Tule Fog Music (find them here).